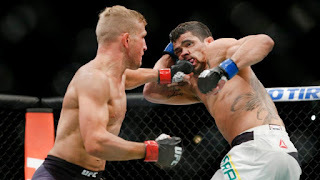 One of the best UFC fights of 2016 could potentially take place next weekend in the main event of UFC Fight Night 81, when current UFC Bantamweight Champion TJ Dillashaw takes on former champion Dominick Cruz in a rare champion vs. champion matchup. Sort of. Remember, Cruz never lost his belt. The former champ, who originally won the WEC bantamweight championship from Brian Bowles in 2010, had two title defenses in WEC over Scott Jorgensen and Joseph Benavidez and two more in the UFC over Urijah Faber and Demetrious Johnson before blowing out his knee and having the title stripped because he had missed too much time. In the minds of many fight fans, Cruz is still the “true” UFC Bantamweight Champion, and they won’t consider Dillashaw the real champ until he beats him. Dillashaw, of course, disagrees with that sort of sentiment, because the current champ beat former pound-for-pound great Renan Barao at UFC 173 to take the belt in a colossal upset, and has since defended the belt twice -- against Joe Soto, who he defeated at UFC 177, and in a rematch against Barao at UFC on FOX 16 -- winning all three of his title fights via knockout. He has been dominant since a controversial split decision loss to Raphael Assuncao in late 2013, and a win over Cruz next weekend would prove beyond a doubt that it’s he, not Cruz, who is the best bantamweight fighter in the world today. Although Cruz has not had any title fights since his 2011 beatdown of Johnson, he has fought once, and he needed only 59 seconds to knock out a top contender in Takeya Mizugaki at UFC 178. It’s hard to say exactly what that win meant in the grand scheme of things, but it was a big win for Cruz, and it was arguably the most dominant he’s ever looked in the Octagon, which is really saying a lot, considering the caliber of opponents he’s fought and the success he’s had in the sport. And because he’s missed so much time due to injury, it’s easy to forget Cruz is on an 11-fight win streak and hasn't lost since being submitted by Faber in WEC in a 2007 featherweight matchup. At bantamweight, though, Cruz is undefeated, unlike Dillashaw, who lost that decision to Assuncao and was knocked out by John Dodson in his UFC debut back in 2011. 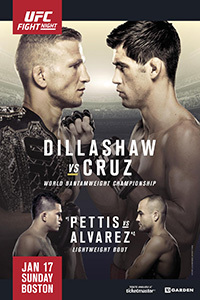 However, the fight between Dillashaw and Cruz is a dream matchup for fight fans, one that pits two fighters with similar elite skillsets against one another in a fight that is close to a Pick ‘em at the sportsbooks. Both fighters come from a wrestling background, but both men are well versed in submissions, and both men are known for being elusive, volume-type strikers. Although Dillashaw is more known for his knockout power, the fact that Cruz finished Mizugaki so brutally and so quickly means you can’t ignore him as a knockout threat either, making this fight extremely intriguing, since both men being wrestlers at heart makes it likely that fans will be treated to primarily a standup fight, one that has “Fight of the Night” written all over it. Like many of the title fights the UFC has put together lately, this is a very difficult fight to call. While Dillashaw has looked absolutely sensational the last few years, you can’t ignore what Cruz has done in the sport, and it’s possible that with all the time off, he’s actually going to be even better when he comes back, which is amazing to think about considering how much better he was than every other bantamweight in the sport before the got hurt. That makes for a super-exciting fight on paper, and considering it’s on a free Fight Night card, this can’t get any better for UFC fans. UFC Fight Night 81 isn’t the best card of the year on paper, but Dillashaw vs. Cruz is a must-watch fight, and we’ll finally find out who the best bantamweight in the world is. Unlike many bantamweight fights, this one isn’t likely to go the full five rounds, so don’t blink when these two rivals step into the cage and fight each other, because it has the possibility of being one of the best 135-pound fights of all time.